Time to start getting excited about Porsche’s first fully electric car. 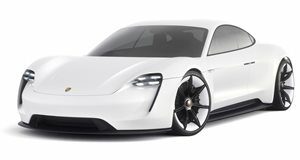 Porsche recently confirmed the , but we’ve seen very little of the electric sedan so far apart from a few . Porsche has already received over 20,000 orders for its first fully electric car, and to celebrate the automaker has released new teaser sketches previewing the Taycan's production design in an email sent to customers who have already placed an order. The photos have also been released online, which you can . If the final production model looks anything like these sketches, we’re in for a treat. "To keep you dreaming about the Taycan on public roads, we have also brought you the latest design sketch of the Taycan from the design studio in Weissach. As you can see, the rest of 2019 looks very exciting! We look forward to sharing these experiences together with you. Bring home the new Taycan today, as a wallpaper exclusively for your desktop,” Porsche wrote in the email sent to prospective customers. Based on these images, the Taycan is looking like an absolute stunner. We were expecting the production model to look toned down from the Mission E Concept, but the design still looks sleek and sporty and features supercar-like proportions. Both the front and the rear bumpers look very sharp, with a large splitter at the front and a massive diffuser-like element at the back. The rear also looks very similar to the new 911’s styling. The Taycan’s blistering performance will also complement the car’s sporty styling. Two electric motors are said to produce a combined output of more than 600 horsepower, enabling the sedan to sprint from 0-62 mph in less than 3.5 seconds. The battery pack will also provide enough juice for a range of over 310 miles in the NEDC testing cycle and take only four minutes to recharge to provide a range of 62 miles. Expect Porsche to release more Taycan teasers between now and the official reveal in September.